Citation Information: J Clin Invest. 2007;117(12):3909-3921. https://doi.org/10.1172/JCI33084. Activation of TLRs by bacterial products results in rapid activation of genes encoding products designed to protect the host from perturbing microbes. In the intestine, which is colonized by a large and diverse population of commensal bacteria, TLR signaling may not function in a simple on/off mode. Here, we show that the flagellin receptor TLR5 has an essential and nonredundant role in protecting the gut from enteric microbes. Mice lacking TLR5 (TLR5KO mice) developed spontaneous colitis, as assessed by well-defined clinical, serologic, and histopathologic indicators of this disorder. 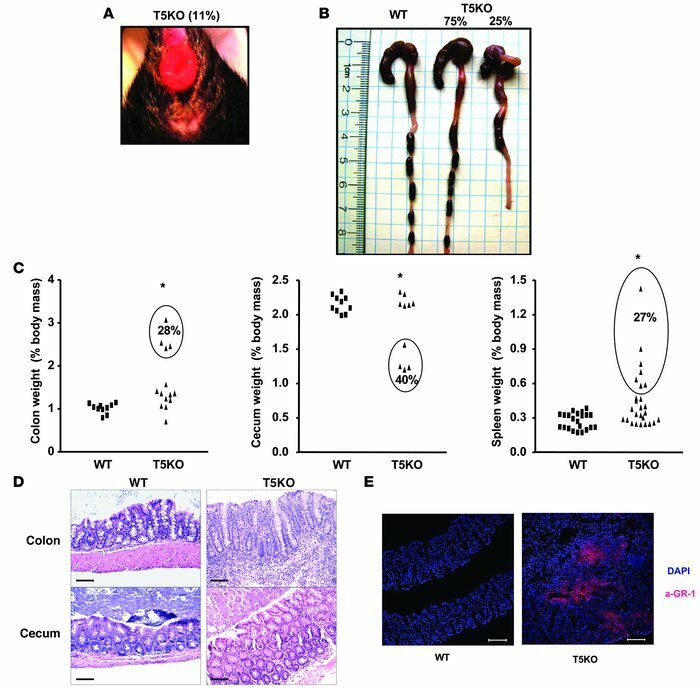 Compared with WT littermates, TLR5KO mice that had not yet developed robust colitis exhibited decreased intestinal expression of TLR5-regulated host defense genes despite having an increased bacterial burden in the colon. In contrast, such TLR5KO mice displayed markedly increased colonic expression of hematopoietic-derived proinflammatory cytokines, suggesting that elevated levels of bacterial products may result in activation of other TLRs that drive colitis in TLR5KO mice. In accordance, deletion of TLR4 rescued the colitis of TLR5KO mice in that mice lacking both TLR4 and TLR5 also had elevated bacterial loads in the colon but lacked immunological, histopathological, and clinical evidence of colitis. That an engineered innate immune deficiency ultimately results in spontaneous intestinal inflammation supports the notion that an innate immune deficiency might underlie some instances of inflammatory bowel disease. TLR5KO mice develop spontaneous colitis. (A) Representative rectal prolapse exhibited by about 10% of TLR5KO (T5KO) mice. (B) Representative gross appearance of cecum/colon of TLR5KO mice and WT littermates. (C) Comparison of organ weights from TLR5KO mice and WT littermates. (D) H&E-stained sections of cecum and proximal colon of TLR5KO mice and WT littermates. Note the extensive immune cell infiltrates, focal crypt epithelial destruction, edema, and epithelial hyperplasia in TLR5KO mice. (E) Immunofluorescent micrographs showing neutrophils stained with anti-GR1 (in red) and counterstained with DAPI to show all nuclei in blue. Scale bars: 100 μM. *P < 0.05.